The nature of the research evidence in homeopathy is a matter of ongoing scientific debate. Homeopathy’s advocates tend to deny the worth of randomised controlled trials (RCTs)  or over-interpret their findings, whilst its critics dispute the therapy’s scientific rationale and the existence of any positive findings in the research literature . There is a need to temper these divergent opinions by considering the existing RCT evidence from an objective, rigorous and transparent assessment of the research, reflecting its particular nature and intrinsic methodological quality. Five systematic reviews have examined the RCT research literature on homeopathy as a whole, including the broad spectrum of medical conditions that have been researched and by all forms of homeopathy: four of these ‘global’ systematic reviews reached the conclusion that, with important caveats , the homeopathic intervention probably differs from placebo [4–7]. By contrast, the most recent global systematic review, by Shang et al., concluded there was “weak evidence for a specific effect of homeopathic remedies…compatible with the notion that the clinical effects of homeopathy are placebo effects” . Four of the above reviews have distinguished RCTs of individualised homeopathy, either by mere identification [4, 8] or in formal sub-group analysis [6, 7]. In their overarching approaches, however, each of these five reviews has assessed together the RCT findings of all forms of homeopathy (individualised homeopathy, clinical homeopathy, complex homeopathy, isopathy) as if they are the same intervention. There are important differences between these therapeutic approaches, especially that individualised homeopathy typically involves a long interview between the practitioner and the patient, whereas the other three forms (non-individualised homeopathy) do not. For a placebo-controlled trial of individualised homeopathy, conclusions about ‘efficacy’ (specific effects) apply potentially to each or just some of the homeopathic medicines prescribed to the individual participants in that trial. A meta-analysis of such RCTs (including those with crossover design, which we excluded—see ‘Methods’) was published in 1998 , using methods that predated the current rigorous standards for conducting risk-of-bias assessments and sensitivity analysis: it reported a significant overall treatment effect that marginally was not sustained for the best-quality trials. We aimed to clarify the results and inferences from RCTs of individualised homeopathy by conducting an up-to-date systematic review and meta-analysis to test the hypothesis: In the context of an RCT, and for the broad spectrum of medical conditions that have been researched, the main outcome of an individualised homeopathic treatment approach using homeopathic medicines is distinguishable from that of the same approach using placebos (i.e. individually prescribed homeopathic medicines have specific effects). Methods comply with the PRISMA 2009 Checklist (see Additional file 1) and with our previously published protocol . A detailed description of the search methods used in this study has previously been published . We conducted a systematic literature search to identify RCTs that compared individualised homeopathy with placebos, and for any medical condition. Each of the following electronic databases was searched from its inception up to the end of 2011, with a supplementary search of the same databases up to the end of 2013: AMED, CAM-Quest®, CINAHL, Cochrane Central Register of Controlled Trials, Embase, Hom-Inform, LILACS, PubMed, Science Citation Index and Scopus. For the 2012/13 update, CORE-Hom® was searched in addition, using the term ‘randomised’, ‘quasi-randomised’ or ‘unknown’ in the ‘Sequence generation’ field. The full electronic search strategy for PubMed (Cochrane Highly Sensitive Search Strategy) is given in our previous paper : ‘((homeopath* OR homoeopath*) AND ((randomized controlled trial [pt]) OR (controlled clinical trial [pt]) OR (randomized [tiab]) OR (placebo [tiab]) OR (clinical trials as topic [mesh:noexp]) OR (randomly [tiab]) OR (trial [ti]))) NOT (animals [mh] NOT humans [mh])’. As stated in our published protocol , we then excluded trials of crossover design, of radionically prepared homeopathic medicines, of homeopathic prophylaxis, of homeopathy combined with other (complementary or conventional) intervention, or for other specified reasons. The final explicit exclusion criterion was that the trial’s team members—specifically the homeopathic practitioner/s—were not blinded to the assigned intervention. All remaining trials were eligible for systematic review. We identified one ‘main outcome measure’ from each study using a refinement of the approaches adopted by Linde et al. and by Shang et al. [6, 8]. Our selection of each trial’s ‘main outcome measure’ at the study end-point (i.e. at the end of scheduled follow-up, unless otherwise indicated) was based on a pre-specified hierarchical list in order of greatest to least importance, recommended by the World Health Organization (WHO) . The WHO approach is an internationally accepted method to ensure that a selected outcome is the most vital to the functioning and health of the patient: it thus ensured our consistent selection of the most important and objective outcome per trial. Two reviewers (RTM and either JC, JRTD, LAL or SM) independently identified the ‘main outcome measure’ and extracted data for each trial using a standard recording approach . Discrepancies in the identification and interpretation of data were discussed and resolved by consensus. We used the domains of assessment as per the Cochrane risk-of-bias appraisal tool . The extracted information enabled appraisal of freedom from risk of bias: ‘Yes’ (low risk), ‘Unclear’ (uncertain risk) or ‘No’ (high risk). We applied this approach to each of seven domains: sequence generation (domain I), allocation concealment used to implement the random sequence (II), blinding of participants and study personnel (IIIa), blinding of outcome assessors (IIIb), incomplete outcome data (IV), selective outcome reporting (V), and other sources of bias (VI). The source of any research sponsorship (i.e. potential for vested interest) was taken into account for sub-group analysis (see below), but not in risk-of-bias assessment per se. Rating A = Low risk of bias in all seven domains. Rating Bx = Uncertain risk of bias in x domains; low risk of bias in all other domains. Rating Cy.x = High risk of bias in y domains; uncertain risk of bias in x domains; low risk of bias in all other domains. An ‘A’-rated trial comprises reliable evidence. We designated a ‘B1’-rated trial reliable evidence if the uncertainty in its risk of bias was for one of domains IV, V or VI only (i.e. it was required to be judged free of bias for each of domains I, II, IIIa and IIIb). Mean, standard deviation and number of subjects were extracted for each continuous ‘main outcome’ and the standardised mean difference (SMD) calculated, reflecting whether a higher or a lower score was in the direction of the hypothesis favouring homeopathy; the number of favourable events and number of subjects were extracted for each dichotomous ‘main outcome’ and the odds ratio (OR) calculated. We did not adjust values to compensate for any inter-group differences at baseline. For key meta-analyses, a single measure of ‘effect size’ was required to enable pooling of all relevant trials, and so SMD was transformed to OR using a recognised approximation method . Random-effects meta-analysis models were used from the outset due to the known clinical heterogeneity among studies. All RCTs that were included in the systematic review were potentially eligible for meta-analysis. If the original RCT paper did not provide or inform adequate information on our selected ‘main outcome’ to enable calculation of the SMD or the OR, we excluded the trial from meta-analysis and described the outcome as ‘not estimable’. The I 2 statistic was used to assess the variability between studies; this statistic can take values between 0% and 100%, with high values indicative of strong heterogeneity. 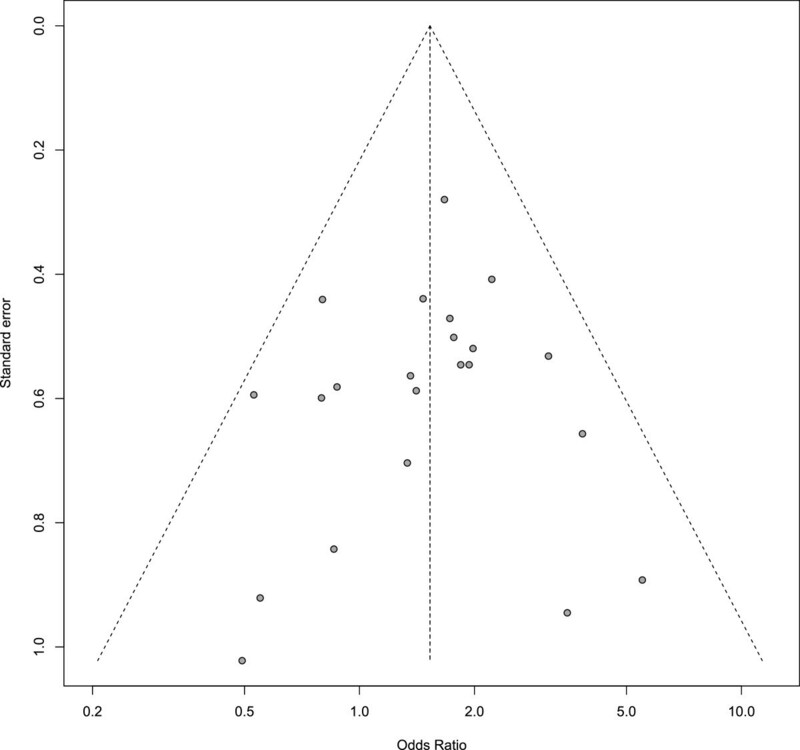 Funnel plots and Egger’s test were used to assess publication bias [14, 15]. Sensitivity and sub-group analyses were carried out, consistent with our published protocol . The sensitivity analysis examined the impact on the pooled OR of trials’ risk-of-bias ratings. Included in sub-group analyses, we aimed to examine whether a trial’s homeopathic medicines had potency ≥12C or <12C (12-time serial dilution of 1:100 starting solution), a concentration sometimes regarded as equivalent to the ‘Avogadro limit’ for molecular dose . The PRISMA flowchart from the original comprehensive literature search has been published previously  and comprises 489 records. The corresponding flowchart for RCT records published in 2012/13 is given in Additional file 2, which features 44 new records. A composite PRISMA flowchart, in standardised format, is given in Additional file 3. Our updated literature search identified a total of five new records that were potentially eligible for the current review of RCTs that compared individualised homeopathy with placebos (Additional file 4, an update of the flowchart in our published protocol ). All five were single-blinded and thus ineligible for systematic review. In total, therefore, 31 records fulfilled the relevant inclusion criteria. Data were non-extractable from 10 of those (see Additional file 4), leaving 21 records potentially available for meta-analysis. One of the included records reported findings from two RCTs. Thus, the systematic review comprises 32 RCTs, with meta-analysis of 22 of those RCTs. The 32 RCTs represented 24 different medical conditions across 12 categories (Table 1). Homeopathic potency was ≥12C in 12 trials and was not exclusively ≥12C for 20 trials (mix of >12C and <12C for 12 trials; unstated for 8 trials). Vested interest was absent in four trials, uncertain in 18 and present in 10. The complete bibliographic details for the studies included are found in Additional file 4. Y yes, U unclear, N no, RA rheumatoid arthritis, URTI upper respiratory tract infection. aVested interest: support (direct, through research sponsorship; indirect, via gifted medicines) from a company that provided homeopathic medicines for the trial. For each trial, Table 2 includes details of the sample size, the identified ‘main outcome measure’ (and whether dichotomous or continuous), the end-point and whether the study was described in the original report as a ‘pilot’ (or ‘preliminary’ or ‘feasibility’) study. The median sample size (for N = 32 trials) was 43.5 (inter-quartile range 27 to 67). There were 28 different ‘main outcome measures’ and for an end-point that ranged from 12 h to 12 months. ITT intention to treat, PP per protocol, Y yes, N no. Table 3 provides the risk-of-bias details for each of the 32 trials and sub-divided by (a) included in our meta-analysis and (b) not included in our meta-analysis. Domain IIIa (blinding of participants and trial personnel) contributed the least risk of bias overall, with no trial classed ‘high risk’. Domain IV (completeness of outcome data) presented the greatest methodological concerns, with 14 trials judged ‘high risk’. Domain II (allocation concealment) presented the most uncertain methodological judgments, with 21 (66%) trials assessed ‘unclear risk’ and 10 (31%) assessed ‘low risk’. A risk-of-bias bar graph is shown in Additional file 5. Trials are arranged chronologically within their risk-of-bias rating category. aUnless a published study protocol was available, completeness of reporting (domain V) was judged solely on correspondence of ‘Results’ with details in ‘Methods’ section of paper. Y yes, U unclear, N no (regarding freedom from risk of bias). Table 3(a): No trial was ‘A’-rated (low risk of bias overall)—i.e. none fulfilled the criteria for all seven domains of assessment. Table 3(a) therefore includes a list of 12 trials that were classed uncertain risk of bias (‘B’-rated) and 10 that were classed high risk of bias (‘C’-rated). Table 3(a) also shows the three ‘B1’-rated trials that satisfied our criteria for reliable evidence. All other trials had unclear or high risk of bias in important methodological aspects and may be regarded as non-reliable evidence. Table 3(b): Trials that were deficient in domain V (selective outcome reporting) included the ten whose data were not extractable for meta-analysis and which were thus ‘C’-rated by default; seven of these ten trials were already ‘C’-rated due to deficiency in at least one other domain of assessment. The data extracted per trial (continuous or dichotomous data) are tabulated in Additional file 6. Figure 1 illustrates the OR for each trial; the original SMD data for each of the studies with continuous data are shown in Additional file 7. Of the 22 trials, 15 had an effect favouring homeopathy (i.e. OR > 1), 3 of them statistically significantly; 7 trials had an effect favouring placebo, none of them significantly. Total sample size = 1,123 (N = 22 trials). 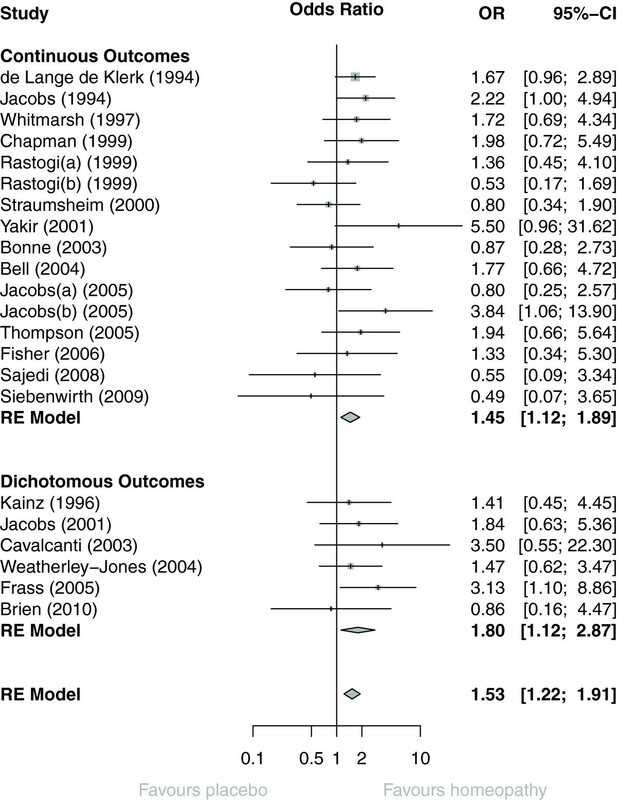 Forest plot showing odds ratio (OR) and 95% confidence interval (CI) for each of 22 RCTs of individualised homeopathy, with pooled OR (random-effects [RE] model) for trials with continuous outcomes, dichotomous outcomes, and for all 22 RCTs. Pooled OR was 1.53 (95% confidence interval (CI) 1.22 to 1.91; P < 0.001). There was no difference depending on whether the ‘main outcome’ was continuous (OR = 1.45; 95% CI 1.12 to 1.89) or dichotomous (OR = 1.80 (95% CI 1.12 to 2.87); P = 0.44). Despite the clinical heterogeneity across the studies, the statistical heterogeneity between the studies was low (I 2 = 0% [95% CI 0% to 40%]), and therefore the variability in the estimated pooled OR is also relatively low. No evidence of publication bias was apparent from the funnel plot (Figure 2) or from Egger’s test (P = 0.59). Funnel plot: 22 RCTs of individualised homeopathy. Figure 3a shows the OR data for all 22 trials, grouped by their ‘B’- or ‘C’-rating. There was no difference between ‘B’- and ‘C’-rated trials: P = 0.41. 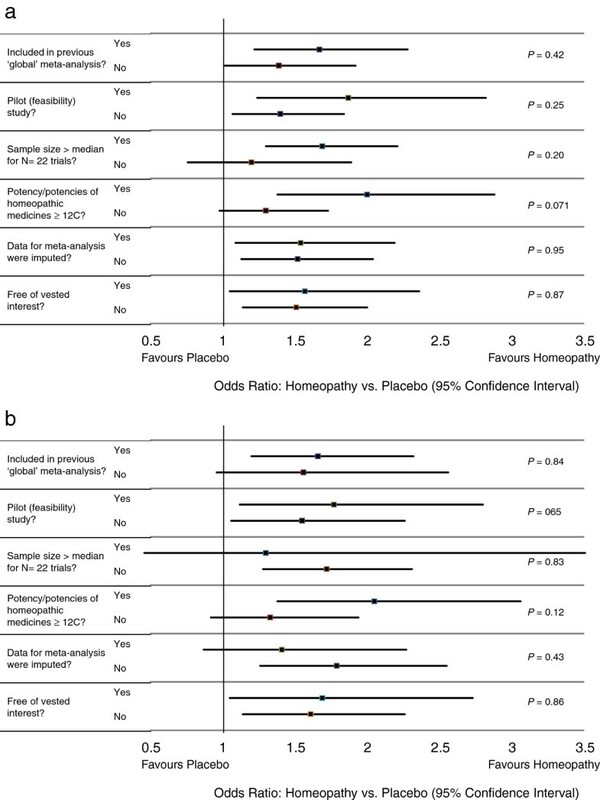 Forest plots showing odds ratio (OR) and 95%cconfidence interval (CI) for each of (a) 22 RCTs of individualised homeopathy, with pooled OR (random-effects [RE] model) for trials with unclear risk of bias (RoB), high RoB, and for all 22 RCTs; (b) 12 ‘B’-rated RCTs of individualised homeopathy, with pooled OR (RE model) for trials with non-reliable evidence, reliable evidence, and for all 12 RCTs. ‘High risk of bias’ (all ‘C’-rated; N = 10): OR = 1.33 (95% CI 0.90 to 1.98; P = 0.15). Figure 3b shows the OR data for the 12 ‘B’-rated trials, grouped by reliability of evidence. There was no difference between the two sub-sets (P = 0.42). Uncertain risk of bias/reliable evidence (N = 3): OR = 1.98 (95% CI 1.16 to 3.38; P = 0.013). Uncertain risk of bias/non-reliable evidence (N = 9): OR = 1.53 (95% CI 1.09 to 2.14; P = 0.014). Figure 4 shows the effect of removing data by trials’ risk-of-bias rating; full details are given in Additional file 8. The set of six trials rated ‘B1’ has been sub-divided by those with/without reliable evidence. The pooled OR showed a statistically significant effect in favour of homeopathy for every value of N, down to and including the final N = 3 trials with reliable evidence. Additional file 8 also states whether a trial was included in the ‘global’ analyses by Linde and/or Shang [6, 8]: of the 22 RCTs we subjected to meta-analysis, 8 had previously been analysed and 14 had not (our selected ‘main outcome measure’ differs for 3 of the 8 trials also included by Shang—Additional file 9). Sensitivity analysis, showing progressive effect on pooled odds ratio (OR) of removing data by trials’ risk-of-bias rating. Pooled OR favoured homeopathy for all sub-groups and was statistically significant for all but two of them (<median; potency not exclusively ≥12C): Figure 5a. There was no evidence of difference in the pooled statistic between any sub-groups. Similar results were seen for the N = 12 (Figure 5b) and N = 3 analyses (data not illustrated). Full details are given in Additional file 10. We observed a statistically significant pooled OR, favouring homeopathy, for the eight trials that we have in common with those previously reported by Shang et al. .
Interactions between sub-groups for (a) all N = 22 trials with analysable data and (b) N = 12 ‘B’- rated trials. Twenty-nine of the 32 trials had unclear or high risk of bias in important domains of assessment. Poor reporting or other deficiencies in the original papers prevented data extraction for meta-analysis from 10 of the 32 trials; the potential influence of the 10 on our overall meta-analysis is unknown, but because of their intrinsic low quality, their absence does not alter our principal conclusions. High and unclear risk of bias featured almost equally in our 22-trial analysis; thus, the overall quality of analysed evidence was low or unclear, necessitating caution in interpreting the findings. As was the case for the previous ‘global’ systematic reviews of homeopathy RCTs that have included meta-analysis [6, 8], there are obvious limitations in pooling data from diverse medical conditions, outcome measures and end-points. Thus, a given pooled effects estimate here does not have a clear numerical meaning or relative clinical value: it is a summary measure that enables statistical significance and mean ‘effect size’ to be attributed and to be interpreted in testing an hypothesis that individually prescribed homeopathic medicines have specific effects. Though our conclusions can be made most securely from three trials with reliable evidence, this sub-set of studies is too small to enable a decisive answer to our tested hypothesis. Equivocal RCT evidence of this nature is not unusual in medical science, in which conclusions are commonly based on just two eligible RCTs per systematic review . Given the specific focus of our study, a statistically significant OR of 1.98 may be interpreted as a small ‘effect size’ for these three trials collectively and does not differ significantly from the ‘effect size’ observed in our analysis of 22 trials (OR = 1.53). Such ‘effect sizes’ seem comparable with, for example, sumatriptan for migraine, fluoxetine for major depressive disorder and cholinesterase inhibitors for dementia . The detection of a small yet significant pooled OR, with the perspective that only a few single trials showed statistically significant effects, supports conjecture that the impact of an individualised homeopathic prescription may be difficult to observe readily in the context of any one particular placebo-controlled trial [19, 20]. Our approach to quality assessment was objective and internally consistent, and the methodological implications of our risk-of-bias findings are the same as those for RCTs in conventional medicine. Indeed, it is noteworthy that domain II (allocation concealment) had the fewest ‘low risk of bias’ assessments (for 31% of our trials): this compares historically with adequately described allocation concealment in just 16% conventional medicine trials that were published during the period 1960 to 1995 . Two of the three trials with reliable evidence used medicines that were diluted beyond the Avogadro limit. Our pooled effects estimate for the three trials, therefore, is either a false positive or it reflects the relevance of new hypotheses about the biological mechanism of action of homeopathic dilutions [22, 23]. It should also be noted that one of these same three trials displayed evidence of vested interest. It remains to be seen if our assessments of model validity  support or refute the legitimacy of these three trials as currently the most important contributors to the evidence base in individualised homeopathy. Our database is different from that of both Linde and Shang [6, 8]. Firstly, we concentrated solely on peer-reviewed trials of individualised homeopathic treatment. Secondly, we have an updated set of trials for meta-analysis: 14 of our 22 RCTs were not included in the previous ‘global’ analyses. Thirdly, our selected ‘main outcome measure’—and thus our calculated OR—differs for three of the eight previously analysed trials of individualised homeopathy. Fourthly, our group of three RCTs with ‘reliable evidence’ is founded on a more exacting standard than for Shang’s ‘trials of higher methodological quality’: indeed, by Shang’s explicit criteria for domains IV, V and VI, we would label five of our ‘non-reliable’ trials [20, 25–28] as ‘higher methodological quality’. A notable finding from sub-group analysis is that our 14 newly examined trials do not differ in ‘effect size’ from the eight that were included in previous ‘global’ meta-analysis by Shang et al. , disputing suggestions that the evidence base in homeopathy is weakening with time . Noteworthy too is the significantly positive pooled OR that we observed for those eight trials and the close similarity of its value to that calculable from Shang’s forest plot data for the same eight . Like us, Linde and colleagues reported a pooled OR of 1.50–2.00 for the highest-quality RCTs [3, 6]. In their separate analysis of individualised homeopathy, however, Linde and Melchart noted a smaller ‘effect size’ whose statistical significance was only marginally not sustained for the highest-quality trials . Unlike our predecessors, we found no evidence that lower-quality trials displayed a larger treatment effect than that of higher-quality studies: indeed, our ten ‘C’-rated trials with extractable data displayed a non-significant pooled effects estimate. It may be that our stringent judgmental approach led to a less extreme range of quality assessments than those of the earlier reviewers. Importantly, we found no evidence of publication bias, removing any need for data adjustment. There was a small, statistically significant, treatment effect of individualised homeopathic treatment that was robust to sensitivity analysis based on ‘reliable evidence’. 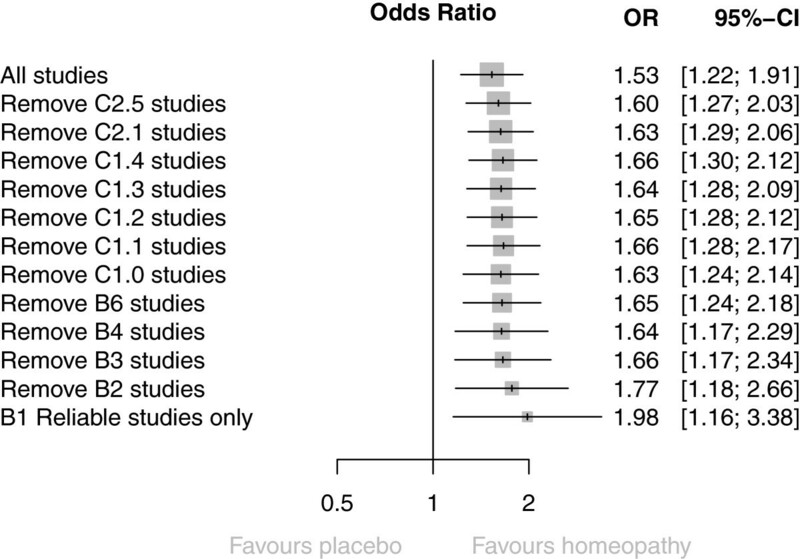 Findings are consistent with sub-group data available in a previous ‘global’ systematic review of homeopathy RCTs. The overall quality of the evidence was low or unclear, preventing decisive conclusions. New RCT research of high quality on individualised homeopathy is required to enhance the totality of reliable evidence and thus enable clearer interpretation and a more informed scientific debate. The study is intrinsic to the work of the British Homeopathic Association through its Research Development Adviser, RTM; it was assisted by a grant from the Manchester Homeopathic Clinic (see below). Trustees and staff of neither charity contributed to the design, analysis or write-up. RTM devised and led the study in collaboration with his co-authors. The study was supported by a grant from the Manchester Homeopathic Clinic to the British Homeopathic Association. RTM, JC and SM are either employed by or associated with a homeopathy charity to clarify and extend an evidence base in homeopathy. The University of Glasgow was supported by a grant from the British Homeopathic Association. All authors have applied the normal high standards of scientific method in the conduct of the work and of complete and transparent reporting in the write-up of the paper. RTM devised and led the study, developed the study protocol and contributed to all facets of the work except the detailed statistical analysis. SML helped to develop the statistical protocol, conducted the statistical analyses and edited the manuscript. LAL helped to develop the study protocol, co-assessed trials for risk of bias, contributed to data interpretation and edited the manuscript. JC helped to develop the study protocol, co-assessed trials for risk of bias, contributed to data interpretation and edited the manuscript. SM co-assessed trials for risk of bias, contributed to data interpretation and edited the manuscript. JRTD helped to develop the study protocol, co-assessed trials for risk of bias, contributed to data interpretation and edited the manuscript. IF helped to develop the statistical protocol, contributed to data interpretation and edited the manuscript. All authors read and approved the final manuscript.